UPDATED: Mon., March 5, 2018, 11:23 p.m.
➤ Thursday, March 8: Eastern Washington Eagles vs. TBD, 8 p.m.
RENO, Nevada – Why not Eastern Washington? Coach Shantay Legans has been asking that question since before the season began, when his Eagles were picked to finish seventh in the Big Sky Conference. 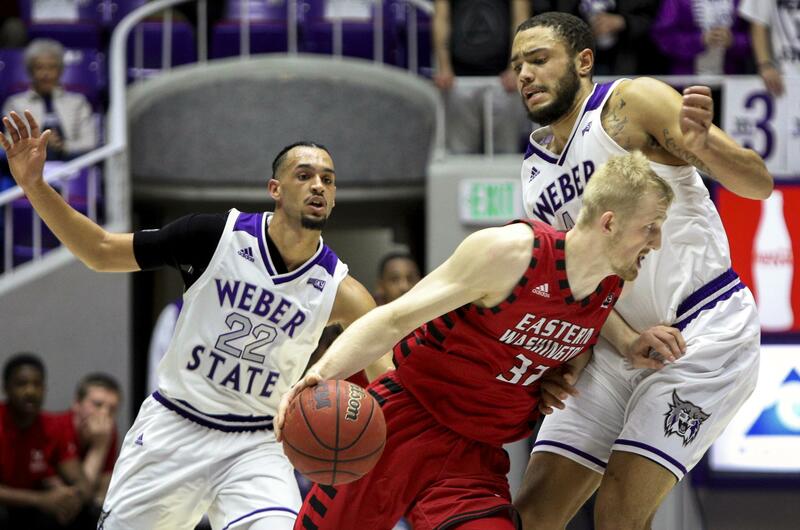 Four months later, EWU heads into this week’s conference tournament as a trendy pick to win it all – mostly because the Eagles are, well, trending. Since suffering their only back-to-back Big Sky losses of the year, to Portland State and Idaho, the Eagles (18-13 overall and 13-5 in the conference) have reeled off six straight. That includes a sweep of the Montana schools, their first road sweep in two years at Weber State and Idaho State, and a convincing final home stand to clinch the No. 3 seed in the 12-team tournament. “They deserve it with the work they put in and how hard they’ve worked since they got here,” Legans said after an 85-68 Senior Day win over Northern Arizona. Legans was talking about seniors Bogdan Bliznyuk and Sir Washington, but may as well have been discussing his whole team. “I think we have the opportunity,” said Legans, whose club will face No. 6 seed Portland State or No. 11 Sacramento State in a quarterfinal game Thursday night at the Reno Events Center. The Eagles have most of the ingredients for a deep run. In conference games only, they rank second in scoring defense (69.2 ppg), fourth in 3-point shooting (40.1 percent) and second in field goal percentage at 48.9. They also have the most consistent player in the tournament in conference MVP Bogdan Bliznyuk, who pretty much demands a double-team whenever he collects the ball at the top of the arc. As they did during their NCAA Tournament run in 2014-15, the Eagles have thrived with their inside-outside halfcourt offense. Three years ago, it was the outside shooting of national scoring leader Tyler Harvey complementing Venky Jois’ thunderous slam dunks. This year it’s the isolation play to Bliznyuk, who has proven to be an outstanding facilitator when he’s double-teamed; his 4.1 assists per game rank second in the conference. On the receiving end of those kickouts, guards Cody Benzel and Jack Perry, have responded with a combined 108-for-273 (39.5 percent) from beyond the arc. “Our players have been doing the things we’ve been asking them to do, and that’s huge for us,” Legans said. Up next is a tricky quarterfinal Thursday night, especially if it’s against sixth-seeded Portland State. The Vikings face 11th seed Sacramento State in a first-round game Tuesday at 8. After an incredible nonconference season that included two wins over Pac-12 teams and three against the West Coast Conference, the Vikings faded to 19-12 overall and 9-9 in the conference. Eastern beat PSU 81-74 in Cheney, but gave up the highest point total of the season in the rematch, a 94-81 defeat in Portland on Feb. 3. Eastern swept Sacramento State. If Eagles reach the semifinals, they may have a chance for some payback against No. 2 Idaho. The Vandals, who swept Eastern this season by a combined nine points, could be waiting in the semifinals Friday night. Eastern will be making its 16th appearance in the Big Sky tournament. Published: March 5, 2018, 4:16 p.m. Updated: March 5, 2018, 11:23 p.m.